The fire that broke out underneath elevated Metro-North tracks in Manhattan and caused crippling problems on the busy rail line appears to have been sparked by an accidental fuel spill, fire marshals said Wednesday. The blaze started Tuesday night at a garden center underneath Metro-North tracks in East Harlem when fuel was spilled on a hot generator during refueling, according to FDNY fire marshals. The resulting blaze burned so intensely that it damaged a center column beneath a viaduct holding the elevated tracks, forcing crews to install six temporary steel columns until permanent repairs could be made. 168 firefighters were called to the blaze, which also engulfed construction debris and several trailers and vehicles. One firefighter suffered a minor injury when he slipped, but no one else was hurt. The city, who owns the lot where the firewood and other flammable material were being stored underneath the track, says it's looking into whether the gardening business that was leasing the space violated any regulations. The fire caused crippling problems on the rail line Tuesday night and forced rail officials to curtail service until at least Friday. Metro-North said two of the four tracks in the area of the fire were operational for Wednesday's morning rush. Trains were slowed from their normal 60 mph to 30 mph as repairs continue. 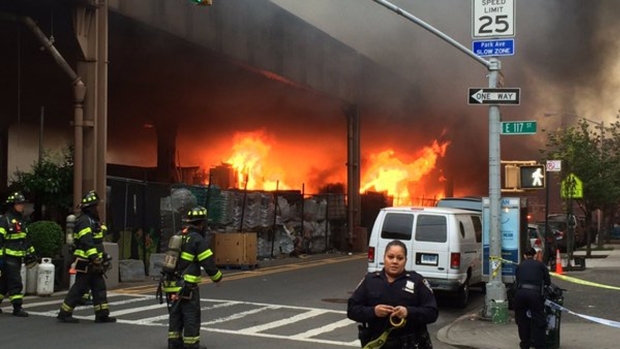 The fire caused damage to a center column beneath elevated tracks. Metro-North encouraged customers to work from home Wednesday or to take an alternate route. Trains were operating on a modified Saturday schedule, capable of carrying about 60 percent of normal capacity. Officials said between 140,000 and 150,000 riders were affected by the delays. Spokesperson Nancy Gamerman said the railroad was working to restore full service by Friday, but that commuters should expect delays because speed restrictions could still be implemented. Commuters are advised to check the Metro-North website for updates. NYC Transit has been cross-honoring Metro-North tickets on subways.Click here for more alternative transportation options. "People can look at the Saturday schedule so they know when the trains are running and plan for extra time," said MTA chairman Tom Prendergast. But many commuters were understandably frustrated by the emergency change, which also slowed trains to a crawl for much of the day and made Grand Central Terminal look like it was in the middle of a rush hour in the middle of the day. New Rochelle commuter Sam Heilman called it a "doomsday schedule" while Natalie Fisher lamented that her ride from Scarsdale took 2 1/2 hours, more than three times as long as her usual 47-minute commute. NBC 4 New York crews also felt the pain. A test ride from Grand Central to East Harlem -- normally zippy 10 minutes -- took 1 hour and 19 minutes. By evening, service seemed more promising. Crowds were much thinner at Grand Central compared to the night before, and one reporter on the New Haven line was on a practically empty train that arrived on time. 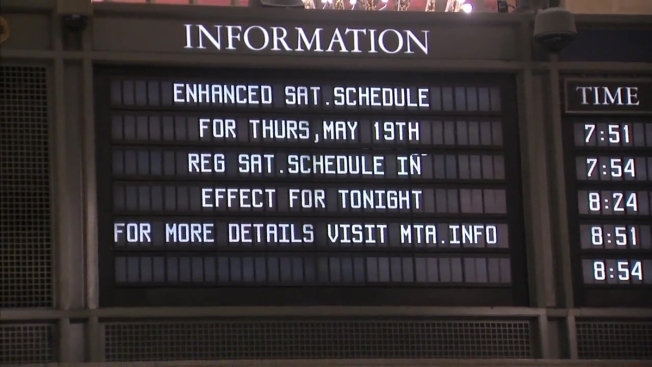 Updated service signs at Grand Central Terminal later in the night also promised more trains by morning.